Coughing is due to irritation of the respiratory tract at any point between the larynx and the deeper parts of the lungs. It serves the purpose of clearing our airways of mucus, bugs and foreign particles. A cough may flare up suddenly, caused by dust, fumes or smoke. But usually it occurs as part of an overall picture of a throat or chest infection. The chest infection may have developed from a cold or it may have started ‘on the chest’. 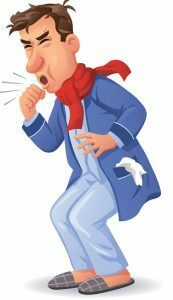 Even a little cough can be debilitating but remember that a cough is a symptom, not a disease in and of itself, that’s often indicative of an underlying condition. The most common conventional treatment for coughs are decongestants and cough suppressants. While these may offer temporary relief from the symptoms, they do so by suppressing the body’s own defences. Cough medicines block the body’s cough reflex, which can be problematic as coughing helps to clear the breathing passages. Aconite: Sudden and violent onset of symptoms of a croup-like cough in very dry cold weather. Often there is also anxiety and restlessness. The person may have a fever and is thirsty, but doesn’t sweat. Bryonia: Slow and gradual onset of cough symptoms, often accompanied by fever. The cough sounds dry and hacking. Very painful cough (sharp and stabbing pains in throat and chest), which is worse from any movement and better for holding the chest. Thirsty for large quantities of water. Cough is aggravated by eating, drinking and entering a warm room. Better for pressure, holding the chest and keeping absolutely still. Worse for any movement and can be worse at night. Drosera: Cough is dry, irritating and spasmodic. Coughing takes breath away. Attacks follow each other very rapidly, can hardly breathe. Coughing is so hard that it can result in vomiting or nosebleeds. Deep barking or choking coughs. Hoarseness of voice. Rumex crispus: Dry, tickling cough preventing sleep. Barking, incessant and tiring cough. Tickling sensation in the throat, as if a breadcrumb is stuck in the throat. Dry mucus membranes followed by sticky mucus. Cough worse by lying on left side, inspiring cool air and at night. Spongia tosta: Dry, barking, croupy cough. Wheezing and rasping. The larynx is sensitive to touch. Raw, tearing and burning pain in larynx from coughing. Cough sounds “dry as a bone”, like ‘ a saw driven through a pine board’. Cough excited by talking. Sensation as if breathing through a sponge. Hoarse voice. Cough is worse in warm room and talking, and better from drinking warm drinks. Antimonium tartaricum: Cough is wet and rattling, but the mucus is thick and difficult to cough up. Breathless, wheezy and noisy chest. Lungs seem full of mucus yet less and less is raised. Gasping fro air before every attack of cough. Cough is worse in warm rooms, overheating and warm weather. Better in cold, open air and sitting erect. Blatta orientalis: Shortness of breath. Difficult breathing, better from expectoration of mucus. The cough is suffocating from great accumulation of mucus. Purulent cough with yellow mucus. Ferrum phosphoricum: Short, painful and tickling cough with sore chest. Hacking, tormenting, spasmodic cough with much production of mucus. Worse at night. Better cold application and lying down. Ipecacuanha: Spasmodic cough with rapid development of phlegm which may be vomited up. Cough is incessant and violent with every breath. The person often feels nauseous and vomits. Cough is worse in warm/damp environment/weather. Better from open air. Mercurius solubis: Shortness of breath when coughing. Excessive yellow/green phlegm, which can be easily coughed up. Cough is worse from drafts, taking cold. Worse changing weather and temperature, and worse at night. Better from moderate temperature and in the morning. Pulsatilla: Cough is productive in the day and dry in the night. Thick, yellow and loose phlegm. All symptoms are worse in hot/stuffy rooms and from warm air, but better from cool, fresh/open air. Keep hydrated! Drinking plenty of water is essential to keep the mucus membranes moist. This is particularly important in winter as houses tend to be dry due to central heating etc.. Add honey or ginger to hot tea to relieve your cough and clear your airway. Avoid irritants, such as smoke, dust, perfumes and scented air fresheners as these may irritate the lining of the mucus membranes of the respiratory tract. Steam! Steam, quite literally, loosens phlegm and mucus and thus alleviates cough symptoms. So by taking a hot shower/bath a cough can be greatly helped. There are other problems, such like a heart condition etc. The new infection is in addition to a long-term chest infection, such as chronic bronchitis or emphysema. Note: Do not attempt to treat severe bronchitis or pneumonia yourself. If you cannot decide which homeopathic remedy to select or if your cough lingers then please book an appointment for a full consultation with a professional homeopath.